By default, nested groups (nested LDAP groups) are not enabled in IBM Connections. What this means, for example, is that if you add the parent group as member of a restricted community, users belonging to children groups are not automatically Community members. To enable the nested group you have to customize the scope of member attributes of Group attribute definition in your federated repository. Save the configuration and restart all components! Put it in the books! For the 7th year in a row, Gartner has placed IBM as a Leader in their recently released 2015 Magic Quadrant for Social Software in the Workplace* based on IBM Connections. We are now getting ready for another major release of IBM Connections and organizations continue to report value from deploying a social collaboration platform such as IBM Connections. If you haven't seen IBM Connections lately, check out this video that we recently published to showcase our secure file editing capabilities for iOS and Android. So where do we go from here? 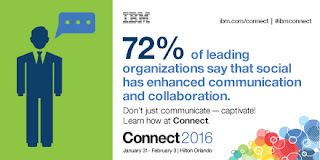 And don't forget to register for IBM Connect on January 2016. We are also just coming back from IBM Insight 2015 and I shared some content so you can see what was presented there. Update 16/Nov/2015: To download the report, you can access it from this page. And then start a free trial of IBM Connections! Last week was a wild ride over at IBM Insight 2015. The IBM Verse and IBM Connections teams were there to share the latest about our products. It was a great opportunity to meet new customers, partners, and fellow IBMers. I co-presented on 3 different sessions around Application Development on top of our cloud platform, Mobile Collaboration, and working with content with IBM's enterprise file sync and share (EFSS) offering, IBM Connections. A key capability here that I wanted to cover was the latest and greatest around IBM Docs. We actually have a major release of IBM Docs coming up here very soon. And given that IBM Docs seamlessly works with IBM Content Navigator it was really well received. If you have IBM Content Navigator, don't forget to take advantage of your entitlement to IBM Docs today! I've uploaded the presentations so you can see the content that was shared.